Across the country, fracking—the extraction of natural gas by hydraulic fracturing—is being touted as the nation’s answer to energy independence and a fix for a flagging economy. Drilling companies assure us that the process is safe, politicians push through drilling legislation without a serious public-health debate, and those who speak out are marginalized, their silence purchased by gas companies and their warnings about the dangers of fracking stifled. 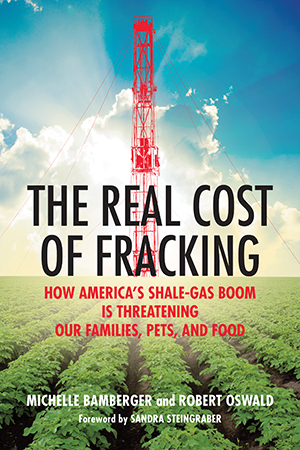 The debate over fracking speaks to a core dilemma of contemporary life: we require energy to live with modern conveniences, but what degree of environmental degradation, health risks, and threats to our food supply are we willing to accept to obtain that energy? As these stories demonstrate, the stakes couldn’t be higher, and this is an issue that none of us can afford to ignore. In the summer of 2009, we were awakened. Articles began to appear in our local papers on the subject of fracking, the common name for the entire process of unconventional gas extraction (horizontal drilling with high-volume hydraulic fracturing) whereby millions of gallons of water, sand, and chemicals are pushed deep into the earth under high pressure to release small pockets of gas held tightly in the rock (see “A Primer on Gas Drilling” in the appendix). In our tight-knit community, people on both sides of the issue enthusiastically expressed their opinions. One article in particular caught our attention and led us to a website indicating that our small property in upstate New York was surrounded by neighbors who had already leased their lands to energy companies for gas drilling. We learned that our land could be drilled under and the gas extracted without our consent. That is, as long as a gas company owns leases on at least a certain percentage of the land (in New York, it is 60 percent) inside a certain amount of space (typically, one square mile), gas can be extracted from properties within that area even if the company does not have a lease on that land. Unleased land is taken by a process known as compulsory integration. We were concerned about what this meant for our water and air—as yet untainted—but we also wondered if our farmers’ markets, CSAs (community-supported agriculture groups), and Finger Lakes wineries could survive the massive industrialization we were beginning to see in Pennsylvania. Would faculty, staff, and students—the mainstay of our economy—continue to be attracted to Cornell University and Ithaca College if the lakes and streams were polluted, the air fouled, and the land mottled by a matrix of shale gas wells? Would tourists continue to visit our picturesque parks, waterfalls, and gorges if thwarted by drilling traffic and diesel fumes? Because of our interest in veterinary medicine, we became keenly aware of what was happening to companion animals and livestock in areas near existing industrial oil and gas operations. We heard stories we found hard to believe: healthy cattle dying within one hour after exposure to hydraulic fracturing fluid; cows failing to reproduce and herds with high rates of stillborn and stunted calves after exposure to drilling wastewater; dogs failing to reproduce after drinking contaminated well water; cats, dogs, and horses developing unexplained rashes and having difficulty breathing after living in intensively drilled areas. Our search for what really happened in each situation led us to document exposures and subsequent health problems by detailed case reports—just as would be done for a new disease—in both animals and their owners. We discovered that all too often, the humans in the household also experienced health problems associated with drilling operations and that sometimes the symptoms were the same ones their pets or farm animals had experienced. As we soon learned, the potential threat to our community is just a small part of a worldwide debate that has at its core the values and essence of modern life. That is, we require energy to live in the modern world, but what degree of risk and environmental degradation are acceptable to obtain that energy? Who should be asked to sacrifice, and who should profit? After untold hours of research, we learned more about the fossil fuel industry than we ever thought we’d have a reason to know. Drilling originally exploited pockets of oil or gas and, in most cases, had a small impact on the communities surrounding the drilling sites, as confirmed by many of the people we interviewed. The changes in recent years, which involve extracting gas directly from shales rather than pockets of gas, have been made possible by two technologies: horizontal drilling and hydraulic fracturing. Shale layers are 50 to 200 feet thick, and in order to contact more of the shale, the drill bit must be turned to run horizontally. The technique of horizontal drilling was actually first applied to dentistry. In 1891, John Smalley Campbell (US Patent Number 459,152) described the idea that flexible shafts could be used to rotate drilling bits for dental applications, but he didn’t exclude the notion that his invention might someday be used for other purposes: “It is obvious that its use is not confined thereto, but that it may be applied to flexible drivingshafts or cables of any other description.” Although the first recorded horizontal oil well was drilled in 1929 in Texas, it wasn’t until the early 1980s that the process was improved and applied with some success. Likewise, one of the first uses of hydraulic fracturing had nothing to do with extracting oil or gas. Instead, Thomas Leonard Watson used an early form of this process in 1908 to separate granite from bedrock in order to study granites. Hydraulic fracturing—using low volumes of water, not the high volumes used today—was introduced in the 1940s and was originally used to stimulate the flow of gas, and subsequently oil, from vertical wells. In this way, the driller could extract oil or gas from relatively nonporous rock, such as shales, rather than simply from pockets of free oil or gas. By the 1990s, the technology for modern-day horizontal drilling was married to fracturing with very high volumes of chemically laced water (slickwater)—thus the term horizontal drilling with high-volume hydraulic fracturing—allowing operators to drill down and turn the bit horizontally within the layer of shale containing the fossil fuels, continuing the drilling for up to two miles. The entire length of the well could then be hydraulically fractured, producing far more oil or gas. The idea was that large regions of the country (shale plays) sit on rocks containing fossil fuels that could be extracted with this process. By dividing these shale plays into spacing units of perhaps one square mile, the entire region could be drilled and enormous quantities of oil or gas could be extracted. In 2008, Terry Engelder of Pennsylvania State University and Gary Lash of State University of New York at Fredonia calculated that the vast Marcellus and Utica Shales underlying parts of Ohio, West Virginia, Pennsylvania, New York, and Maryland contained almost 500 trillion cubic feet of gas. They proposed that this vast reservoir of gas could be the nation’s answer to energy independence, a flagging economy, high unemployment, and global warming. Along with other shale plays in Texas, Oklahoma, Colorado, Wyoming, Arkansas, North Dakota, and elsewhere in the United States, the nation would become the next Saudi Arabia of fossil fuels. Although we have little infrastructure to use methane as a fuel in transportation, and although multinational companies with no allegiance to our country are often the ones extracting our fossil fuels, the unconventional oil and gas revolution was also touted as a way of weaning ourselves off foreign oil. But the more we learned about unconventional fossil fuel extraction, the more we realized that the prospects may not be as rosy as have been projected by the oil and gas industry. The US Geologic Survey reduced the original estimates of gas in the Marcellus region from 500 to 84 trillion cubic feet. The lower estimate represents little more than three times the US yearly domestic gas use, with all of New York potentially contributing, at best, a six-month supply from the Marcellus Shale (not taking into account the plans for export of natural gas by multinational companies). At least for New York, this is likely to be an overestimate, since only wells drilled in counties near the Pennsylvania border are likely be profitable. Also, the output from shale gas wells has been found to decrease dramatically after the first year, suggesting that the production estimates may decrease further. Moreover, when the price of natural gas was low in late 2013, the industry and the US government were prompted to search for more ways of using the product and converting terminals previously used to import gas into export terminals to send the gas to foreign markets. Whether any of the claims associated with the current “oil and gas boom” will stand up to careful scrutiny is a matter of ongoing debate, but large-scale industrial drilling has definitely moved into more densely populated areas and has garnered a massive amount of attention.